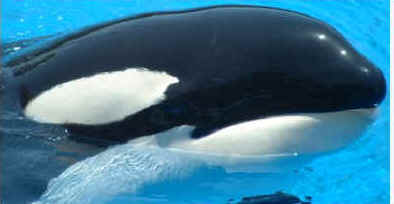 Corky was an Orca held captive at Marine World Africa USA in Vallejo, California. Along with others, I protested against keeping Orcas and other marine mammals in captivity. In the wild, their average lifespan is between 50 - 80 years. In captivity it is drastically reduced. They swim 50 - 100 miles a day in the wild. 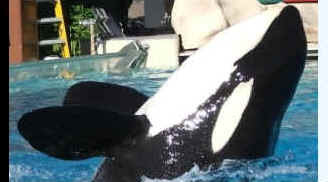 In captivity, they spend the remainder of their lives, in boredom, swimming in circles and doing "tricks" in a tank. The general public won't know that Corky is one in a number of many Orcas who will be brought in to replace the one that just died and will be given the same name. Corky was captured off the coast of Vancouver Island, British Colombia. I wrote this letter to her after the protest. I was deeply saddened by the fact that I was able to come and go as I please and that Corky would remain in the confines of a small tank for the remainder of her short life. Your sister is always with you.